We know the world is warming and that, unless things drastically change, we will keep emitting more carbon. We know the two are linked. But exactly how much warmer will it become as we emit more carbon? It’s one of the most important questions we all face. It lies at the heart of the Intergovernmental Panel on Climate Change’s 5th report on climate science, which appeared in 2013. The lead author of the report, Professor Tom Stocker, identified the most important finding as the analysis of the link between cumulative carbon emissions and global mean surface warming. This question of how much warmer it will get as we emit carbon is usually only understood using highly complex climate models, including many physical, chemical and biological processes. These climate models are like extensions of weather forecast models, but projecting over the next century, rather than the next week. 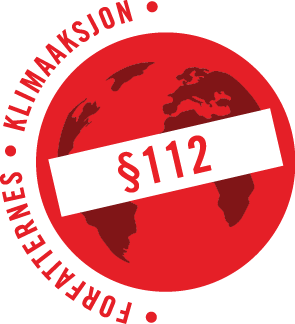 The climate projections are calculated for various “emissions scenarios” – defined rates of carbon emissions for every year, ranging from a best case scenario where emissions are reduced to a worst case where nothing is done and emissions keep increasing. Analysis of the climate models found a deceptively simple result: climate warming depends almost linearly on how much carbon we emit, rather than the details of the particular emission scenario. This is because the most important factor behind global warming is the total amount of carbon emitted since the pre-industrial age, not the details of the rate of carbon emitted in every particular year. You can see this response on the graph above for how temperature has increased versus carbon emissions since 1870. 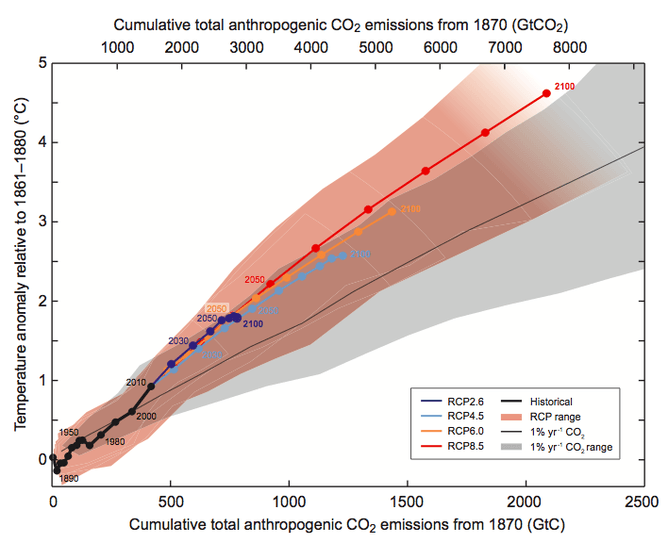 The different coloured lines show different emission scenarios with the precise timing of how much carbon is emitted over the next 100 years. However the red, orange, light and dark blue lines for the different emissions all nearly lie on top of each other in the graph. Therefore, to know how warm it will be in, say, 2100 all you need to know is the total amount of carbon emitted up to then, rather than the details of the emission scenario. In order to understand why climate warming links so simply to how much carbon we emit, we have gone back to basics, drawing on simple climate theory to understand the climate response. Our research is published in the latest edition of the journal Nature Geoscience. We derived a relatively simple equation, using global heat and carbon budgets to connect climate warming to how much carbon has been emitted since the pre-industrial era. The equation includes crucially two competing factors: how the ocean takes up heat and how the climate system takes up carbon from the atmosphere. We found that the simple link between warming and carbon emissions emerges due to how the ocean takes up heat and carbon. There is a reduction in surface warming over time from the way the ocean soaks up carbon dioxide, which is almost cancelled by the increase in surface warming from the way the ocean soaks up heat. This link means that whatever warming we experience, it will stay around for many centuries after carbon emissions are stopped. We found from our simple theory that we will experience around 1°C of warming for every million-million tonnes of carbon emitted, with an uncertainty of around half a degree. This warming range from our simple theory agrees well with earlier findings from complex climate models, thus highlighting the crucial role of the ocean in connecting warming to emissions. But our results could be amplified by other climate forcing, such as release of other greenhouse gases, including methane from direct emissions, marine hydrates or permafrost.